This workshop will serve as a brief overview of the current research that exists regarding assessments, programs and materials for heritage speakers in the foreign language classroom. Further, we will explore how to adapt differentiated and guided instruction in order to facilitate learning in both classrooms consisting of only heritage speakers, and those with mixed learners and/or proficiency levels. 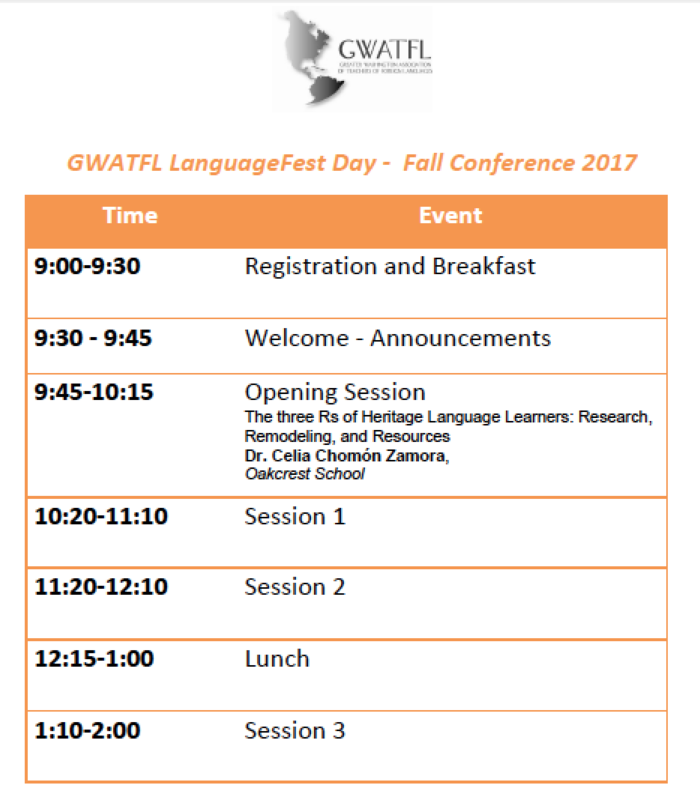 Lastly, sample lessons, materials and sources will be presented which will help educators understand how to adapt their language classrooms. Wondering why so many people are talking about CI/Comprehensible Input? Comprehensible Input is not just another fad—it is a philosophy that answers the question of how language acquisition occurs. This workshop will introduce teachers to foundations in the brain research in Second Language Acquisition that supports the use of Comprehensible Input (CI) in the classroom. Teachers will leave with concrete, easy-to-implement CI strategies that will ensure real acquisition and create an empowering class culture. In this session participants will explore the purpose of centers in a foreign language classroom and discuss best practices for centers. They will be given examples of centers that can be used at all levels and in all languages. ​The Office of Public Engagement (OPE) connects the Department of State to domestic audiences, directly engaging the American people to explain the Department’s policies and priorities at home and abroad through briefings, conferences, and other events in Washington, D.C. and around the country. The office also connects students and teachers to State Department experts that engage them on key foreign policy priorities and start a dialog on why diplomacy matters. How can foreign language teachers engage with these experts? In this session, you will learn about the State Department’s public engagement programs designed to connect with your classroom – to enhance your students’ knowledge of real-world foreign language use, international careers, and the cultures of the countries they are learning about. The session will explain the speakers program, Foreign Policy Classroom, Foreign Affairs Campus Coordinator program, Hometown Diplomats, and many others. The purpose of this session is to provide proven strategies for engaging all Heritage Language learners. No matter what language you teach, the responsibility of the language teacher is to ensure he/she strengthens the connection of the students to their heritage and culture. Once this connection is established, the rest of the year will be smooth and enriching for both teacher and students alike! Other topics include: teaching pride in bilingualism, the importance of self-identity, culture through literature, importance of comparison skills, and raising the academic language bar. All of these ingredients in your Heritage Language learning courses will make for a rich, delicious "pozole" of a year! Backed by scientific research, mindfulness meditation has had an impact on American educational settings over the last ten years. However, lately, it has been at the forefront of best practices at all levels of instruction. Mindfulness enhances open attention to the present moment by focusing on our breath, for example, and it can be easily integrated into the academic curriculum to promote the well-being of both educators and students. This session aims at providing an introduction to the field of mindfulness, and it offers engaging tools that can be used in different school environments and in all languages. This session explores how to teach complex global issues in the intermediate language classroom with specific examples from the Spanish and German contexts. Special attention will be paid to immigration and migration in terms of definitions, images, videos, texts such as newspapers and government websites, and graphs so students have a better understanding of both culture and community. In addition, this session discusses classroom activities and outcomes for assessment. Grammar courses have a dominant position in our educational university curricula. The present study investigates the English grammar instruction Moroccan university EFL learners receive in order to determine its effectiveness. To this end, we will identify the underlying characteristics of English grammar instruction in five Moroccan higher education institutions, the general attitudes learners hold vis-à-vis the course under study, the major factors that may influence these attitudes and the relationship between the learners' academic level and their general attitudes. Hence, structured questionnaires were administered to 300 university first year learners who were drawn from different regions of Morocco. Course description was also used to validate and support the already obtained data through the questionnaires. The present investigation constitutes a strong evidence against the validity of product approach to grammar teaching adapted in most English departments at Moroccan universities and a determining basis for further research on the role of grammar teaching in the language curriculum in EFL situation. Differentiation is a buzzword used across the K-12 educational world and for good reason - each student has a unique set of needs that must be met for them to succeed. With large class sizes and sometimes infrequent meetings, this can lead to immense challenges for elementary world language teachers. Our session explores how EdTech (educational technology) solutions can help. Based on both classroom teaching experience and our familiarity with EdTech as virtual language learning program entrepreneurs, we will guide teachers through how to identify and integrate these resources into their classrooms for maximum student impact and engagement. You have decided to switch from traditional assessments to Integrated Performance Assessments (IPAs). But what should you do next? What can you do each day in your class to prepare students for the IPA? In this session, you will learn activities for your classroom for novice and intermediate learners. While keeping backwards design in mind, you can learn techniques to help your students improve their proficiency in each mode. This session will cover activities for interpretive, interpersonal and presentational modes. In this session, how to choose the right authentic materials and integrate them into unit/lesson plans as well as assessments will be discussed and demonstrated with examples. The authentic materials will include the use of videos, visual and written texts. Additionally, teaching in authentic cultural context, which is an effective way to transform less interesting language lessons from textbooks into fun topics that motivates teenage students will also be presented. Although the examples are from Chinese classes, the approach will apply to all. This presentation will focus on authenticity through the inclusion and analysis of historical roots and cultural topics that examine traditional rhythms within the Hispanic cultures of the Afro-Mexican, Afro-Peruvian, Afro-Cuban, Afro-Puerto Rican, etc. Importantly, authentic teaching/learning materials represented by video clips, music, photography, etc. of the African diaspora stimulate the engagement and the assessment of the ACTFL presentational, interpretive, and interpersonal communicative modes. African influenced Hispanic cultures of Latin America and the Caribbean provide diverse and culturally rich resources that take into account the implications of the theory of multiple intelligence (Gardner, 2006) in the student-centered teaching/learning process. Ever feel stressed about how best to “teach” students about culture so they can write great essays on the AP exam? Ever wonder if they or you even really know what culture is beyond heroes, holidays and food? Learn how to elevate your students thinking and understanding of culture; both their own and the culture of others. Using effective tools and strategies, you will improve your students' ability to write more authentic and specific cultural comparisons, while also avoiding stereotyping. Taught by Anna Gilcher, and AP French teacher and AP French Reader.